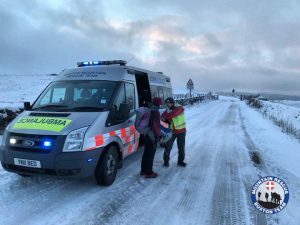 The team were called out late afternoon to assist motorists who had got into difficulty in the Goyt Valley. The roads into and out of the valley are still snow and icebound and the occupants, who were not local, had driven into the valley. Due to the road conditions they were unable to drive back up out of the valley. The team helped walk the occupants to the warmth of Mobile 2, whilst a local farmer towed their vehicle back onto the gritted and treated roads. It was an honest and innocent mistake, and the vehicle occupants were grateful for the teams assistance.